This design hotel with a Parisian theme décor is just a 10-minute walk from Gare du Nord and Gare de l'Est Train Stations. It offers free Wi-Fi access. Air-conditioned guest rooms at the Eurostars Hotel by Exe Panorama are elegantly furnished. Each includes satellite TV, free Wi-Fi and a private bathroom. A full buffet breakfast is provided daily, where guests can enjoy French pastries and a variety of hot and cold dishes prepared using seasonal produce. Other facilities include a bar, a lift and a 24-hour reception. Room service is also available 24 hours a day. 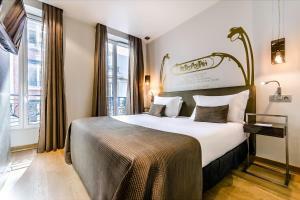 Eurostars Hotel by Exe Panorama is located halfway between Rue Lafayette and Montmartre. It is situated a 2-minute walk from Poissonière Metro Station, providing direct access to the Galeries Lafayette and the Louvre Museum. The hotel reserves the right to request a security deposit (in cash or credit card) at the time of check in, to ensure extra charges, which will be returned at the end of stay. This room with air conditioning has a TV with satellite channels, a minibar and a private bathroom with a hairdryer. Each room is decorated with a different, typically Parisian element. The suite features a seating area with LCD TV, a minibar and a desk. A telephone and a safety deposit box are also provided. The private bathroom is fitted with a shower and a hairdryer. The room is suitable for people with reduced mobility. This air-conditioned room includes a satellite TV, a minibar and a private bathroom with a hairdryer. Rate: € 148.49 ... € 515.81; select dates below to get current rates.